A & B The Bible for the Young, by Dr. Paterson Smyth (PNEU Office, 1/6 each): a) Moses and the Exodus, Lessons 17-24, b) St. Matthew's Gospel, Lessons 16-24. Teacher to prepare beforehand: in teaching, read the Bible passages ONCE and get the children to narrate; add such comments (see Paterson Smyth) as will bring the passages home to the children. Children might use Bible Atlas (S.P.C.K. 1/3). The Children's Book of Prayers, by S.B. Macy (Longman's, 9d.). A Sun-Babies, by C. Sorabji (Blackie, 7/6). A Book of Golden Deeds, by Charlotte Yonge (Macmillan, 2/-), pp. 1-147. B Mrs. Gatty's Parables from Nature (Dent, 2/6), or, The Child's Book of Saints, (Dent, 2/6), may be used. A & B Sidelights on the Bible, by Mrs. Brightwen (R.T.S, 3/-). The Wonderful Prayer, by G. Hollis (S.P.C.K., 2/6). A A New Handwriting, by M.M. Bridges (P.N.E.U. Office, 5d. each card; instructions, 6d. ): card 1, lines 1 and 2; card 3, lines 1 and 2. Two letters to be mastered each lesson. Teacher study instructions. Transcribe from reading books, and write words and short sentences from dictation. B A "New Handwriting," card 3, lines 1 and 2; one letter to be mastered each lesson, teacher study instructions. To be able to write, or print, letters and words from dictation as well as from copy (see Home Education, p. 234). Beginners-right-hand half of card 4 of The "New Handwriting." A Pilgrim's Progress* (B.T.S., 9d., or better, 3/-), Part II., to "the Two Lions." Tales of Troy and Greece*, by Andrew Lang (Longman's, 4/-), pp. 191-239. B Three Fairy Tales. Andersen's Fairy Tales or Grimm's Fairy Tales (both Oxford Press, 1/6, or Dent, 2/6), may be used. Three fables, Aesop's Fables (Murray, 2/-). A Our Island Story,* Vol. I, by E.H. Marshall (Jack, 3/6), pp. 58-93. Mrs. Frewen Lord's Tales from Canterbury (Sampson Low, 1/6), pp.3-36. B Ambleside Geography Book, Book I, pages 26-40. The World at Home (Nelson, 5/-), pp. 190-238 (out of print), or, The Pigtail Boy (Milford, 6d. ), and Sancho, the Portuguese (Harrap, 1/-). Describe, and tell the boundaries of, three fields. A & B Keep a Nature Note-Book (P.N.E.U. Office, 6d., and see Home Education). Find and describe (a) six wild flowers; watch, if possible, and describe (b) ten birds, (c) five other animals. [The Changing Year, by F.M. Haines (Wadsworth, 3/-), or, Countryside Rambles, by W.S. Furneaux (Philip, 2/6): April to July. Furneaux's A Nature Study Guide (Longman's, 6/6), may be used for special studies and for reference.] See also Scouting Tests in Nature Lore: Parents' Review, 1920. A Birdland Stories, by O. Pike (R.T.S., 6/-), pp. 45-74, or, Insect Life*, ("Eyes and No Eyes Series," Cassell, 1/3). Tommy Smith's Animals*, by E. Selous (Methuen, 2/9), pp. 74-142, or, Animal Life in the New World*, by M. Duncan (Oxford Press, 1/6), pp.41-81. B Plant Life in Field and Garden*, pp.26-66, by Mrs. Fisher ("Eyes and No Eyes Series," Cassell, 1/3). Tommy Smith at the Zoo, pp.1-52 (Methuen, 2/9), or, Animal Friends, by M. Duncan (Oxford Press, 1/6), pp.40-88. A & B- Study reproductions of six pictures by Corot* (P.N.E.U. Office, 2/- the set): teacher see notes in the April No., 1922, of the Parents' Review. A Pendlebury's New Concrete Arithmetic (Bell), Year II, (5d. ), Term III, or A New Junior Arithmetic, by Bompas Smith (Methuen, 4/-), pp. 1-7,8,14,15, 60-63, taking different examples. Tables up to twelve times twelve (five minutes' exercise in every lesson). Tables to be worked out in money thus: 9 x 7 = 63. 63 pence = 5s. 3d. B Pendlebury Year I*, Term II, to be worked with dominoes, beans, etc. Rapid mental work. A Illustrated French Primer*, by H. Bue (Hachette & Co., 2/6-),pp.101-112; 148-158, inclusive. Children to narrate. French Fables in Action, by V. Partington (Dent, 2/-), pp.15-23. B Illustrated French Primer, by Henry Bue (Hachette & Co., 2/6-), pp.87-44 (94? ), 118-120, inclusive. Words to be taught orally with pictures. Children to narrate The Children's Entente Cordiale, by L.M. Oyler (Jack, 1/6), Nos. 11-15 (very inaccurate, yet very useful). A & B Six wild flowers (from memory); six animals that you have been able to watch; and pictures of people you have read about in your Tales, in brushwork. Children should draw occasionally with brush or chalk from memory. Pencils should not be much used. For chalk drawings, milled blackboards (P.N.E.U. Office, 2/- each) may be used. Paintbox with specially chosen colours and brush (P.N.E.U. Office, 8/-). What to Draw and How to Draw It (Skeffington & Son, 3/6). A & B To recite a poem (each child may choose a different one), to learn two hymns, Psalm 111, and two suitable passages of six verses each from (a) Numbers, Chapter 22,(b) St. Matthew, chapter 25. IA, The Fairy Green, by R. Fyleman (Methuen, 1/6). IB, Recitations for Little Children, by G.H. Tuffley (1/-). Children who can read may use The Happy Reader, Part II, by E.L. Young (Simpkin, Marshall & Co., 1/-),taught according to directions in preface. A & B Child Pianist (Curwen & Son, 3/-), continue Teacher's Guide, revised edition (7/6). Programme of Grieg's music (to be heard), Parents' Review, April, 1922. A & B Two French songs, French Songs, by Violet Partington (Dent, 9d. ), or, French Rounds and Nursery Rhymes (Angener, 6/-). A Ten Minutes' Lessons in Sight-Singing (Curwen & Son, 2/6), lessons 20-23. Two English songs: The National Song Book, edited by C. V. Stanford (Boosey & Co, words and voice parts 1/9 each, complete with music 6/-). A & B The Joyous Book of Singing Games (see above), or, Rhythmic Games and Dances, by Florence Hewitt (Longmans, 3/6). Syllabus of Physical Exercises (Eyre & Spottiswoode, 1/6), Tables 9-12. Teacher see pages 161-168. Skipping British Marches for Schools, by Martin Shaw (Evans, 4/6). Students take House of Education Drills. A & B Help in house or garden. Claymodelling, by H. Unwin (Longmans, 4/6). The Little Girl's Gardening Book (Mills & Boon, 2/6). Little Girl's Sewing Book; The Little Girl's Knitting Book (R.T.S., 2/6 each). Teachers will find suggestive What shall we make? by M. La Trobe Foster (C.M.S., 1/-). A Paper Modelling, by M. Swannell (Philip & Son, 3/6), Series III., 1-5. B Paper Folding, by H. G. Paterson (P.N.E.U. Office, 2/6), (materials 8d. ), models 17-28, and two other original models on the same lines. All children should spend two years in Form IA. In the second year they should read their own books and sometimes write narration. Classes in the second year of IA might be called "Upper IA." N.B. 2.--Each child in A should have a copy of all books, etc., marked * and a set of the Pictures and materials. One copy of the other books is sufficient. The books from "Recitations" onwards are advisable but optional. N.B. 3--For methods of teaching the various subjects see Home Education, 5/6, School Education, 5/. (P.N.E.U Office). N.B. 4.--All book, etc., may be obtained from the Secretary of the P.N.E.U., 26, Victoria Street, London, S.W.1, as well as exercise books bearing the school motto (ruled single, double lines and squares), 6d. each, and Cambridge paper for the Examination 1/6 for 4 quires (not less); envelopes to match 1/6 a packet. Also the School Badge (4/6), School Hat Band (2/6), and Ribbon 2/3 a yard. Badges stencilled in washing colours on pale blue linen may also be obtained, 4 1/2d. unmounted, 6d. mounted. N.B. 7.--All letters re. School and Programmes, except book orders, should be sent to Ambleside. The enclosed Order Form for books should be used. 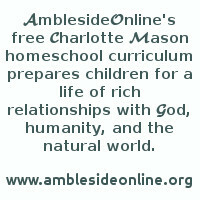 Members are asked to send the School Fees direct to Ambleside. P.N.E.U. subscription, money for books, etc., should be sent to the London Office.